I always love your recipes so much. I'd love to see this recipe made with homemade or non-GMO mayo and organic hormone-free chicken from your local farmers market. Your such an amazing cook I know it would be great. Thanks Anonymous for the very kind compliments :-) I agree. Whenever possible homemade, organic, all natural is the way to go. I am always looking for new ways to make boneless, skinless breasts. I have seen this type of recipe before, but have always been a little skeptical because of the mayo.... I am not a mayo lover, but if your hubby liked it, then I probably would too! They look delicious!!!! We love using Greek yogurt! Way better for you! I've seen this recipe and wondered if it could really be as good as they claim...glad to hear that it is! 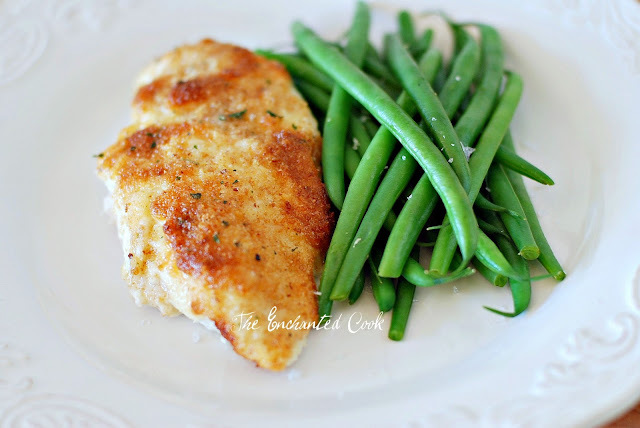 I'm going to make this one night very soon...it looks PERFECT for a busy weeknight meal!! Love recipes that have simple and few ingredients. Also even better that this is baked. I cook so many things coated in Best Foods. It is the miracle ingredient. Yumm! Last night I tried this recipe. And it was just so wonderfully easy. I never would have thought of putting mayo on chicken and sticking it in the oven. But the result was really good. The chicken was moist, and great crust. made this for my hubby...we both loved it! so easy! What a great recipe Veronica..Love your photos! Have a wonderful holiday season!!! I can say with certainty that my whole family would love this recipe! Isn't always nice when it's the simple one that they like? Thanks! Does anyone know if light or ff mayo would work? Need to cut some calories & fat in our dinners. Hi Anonymous - I've subsequently made this with Hellman's/Best Light Mayo and it is equally fabulous! We never get tired of this dish. One of the easiest and tastiest chicken dishes I've ever made. I added a little garlic powder to the mayo mixture because, well, I like garlic. We were eating within 30 min of me getting out the ingredients! Just can't believe how easy it was to make. Thank you! i see this recipe in people magazine all of the time but have never tried it- I definitely am now! i had no idea there were so many ways to incorporate mayo in dishes! thanks for sharing! If I don't have grated parmesan, will the powedery kind work? Hi Callie - the texture/consistency will be different but possibly not bad. Let me know if you end up trying it that way and how it comes out. I didn't have grated cheese so I used the "powdery kind" and it was absolutely DELISH! I guess I can't compare the consistency or texture since I haven't made it the real way... but if the way I made it was DELISH I can only imagine that with the grated cheese it will be DOUBLE DELISH! Thanks for the recipe... its going to become a new fam fav! I am so glad to hear that!! Mystery solved! Thanks Emily! I can't wait to make this chicken. This similar recipe can be made with white fish and Miracle whip for a tangier recipe. Very delicious and will definitely give it a try! This might be a silly question, but you only spread the mayo and breadcrumbs on the top of the chicken? Does the bottom just hang out and cook? Thanks! I add some sun dried tomatoes for a little pop of flavor. Could you use greek yogurt in place of Mayo?? hmmm....might be good! Hi there - you certainly could! Won't have the tangy deliciousness of Hellmann's ;-) but with some seasoning it would be wonderful. I'd mix some fresh squeezed lemon juice into the Greek yogurt and maybe a little salt if needed. Made this for dinner tonight using lite mayo... It was delicious! Thanks for sharing! So glad to hear it! We never get tired of this dish! 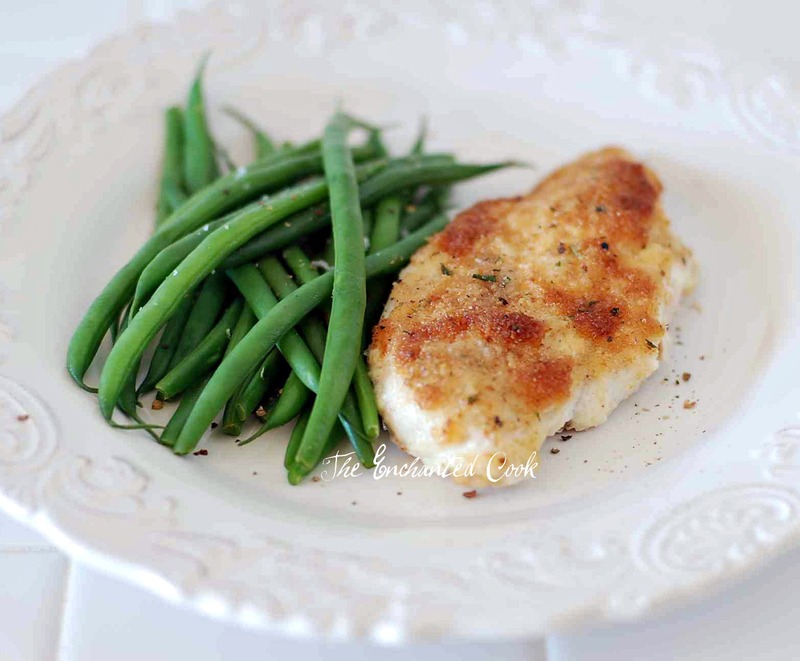 I use this recipe but substitute frozen haddock filets instead of chicken. I will have to try with chicken now. And I will have to try it with fish now! Yes, uncovered! So easy, right? This looks delish! I often make Hellman's Caesar chicken (hellman's, parm, minced garlic, and worcestershire) and it is sooo delicious, especially when you save some of the sauce before contaminating it with raw chicken, and dip new or roasted potatoes in it...I am going to make your recipe tonight for supper! It's amazing how yummy mayo makes things and I don't even like mayo!! Like chocolate cake with mayonnaise!? You'd think gross, but yummmm! Thanks!! ooooh, the Caesar version sounds awesome! I'm making this tonight - baked it 25 minutes & the chicken is still raw. I'm baking for another 20 minutes. Your baking time seemed too low, and suggest you mention additional time in the recipe. Hi - I've made this numerous times and 20 minutes has consistently been the norm for me. I'm wondering if your chicken is much thicker, and/or bone-in (recipe calls for 4 boneless breasts at a total weight of about 1 1/4 lbs, so about 5 ounces each)? If both are "no", then have you checked to be sure your oven is heating at an accurate 425 degrees F? I can't think of any other reasons there might be, unless you are cooking other things in the oven at the same time. Thanks for your comment and I hope this helps. I noticed in the pic above, that the package says, "breast filets" which are thinner than regular skinless boneless breasts. Maybe that's why some people's are still raw after 25 min and other people's are cooked? Thanks Bloggerfan - that's very possible. I'll make an additional note to specify that each breast is about 5 ounces, which may help clarify. hello is it ok to use bone chicken and pound it flat? Can someone please tell me if they've tried this with fat free hellmans/best foods and if so, does it turn out just as well? I don't use real mayo as I am on Weight Watchers but the rest of this recipe is quite doable! Someone put this on pinterest and they claim to have used sour cream or yogurt instead. Hoping someone else who's tried with fat free Hellmann's replies, but in the meantime, I've tried with Hellmann's Light and the taste and texture are just as yummy. I checked Hellmann's website and they state the following: "Also terrific with Hellmann's® or Best Foods® Light Mayonnaise or Hellmann's® or Best Foods® Canola Cholesterol Free Mayonnaise." I am on the strict phase of the South Beach Diet and cannot have bread of any kind, can I skip the bread crumbs? I also saw the pinterest post which called for sour cream instead of mayo. So I went to the store and here I am with only sour cream! I'm hesitant to make the recipe now...so I think I'll hold off unless someone can confirm that this works with the sour cream instead of mayo! I've REALLY been looking forward to making this recipe!! Thanks everyone! Is the sour cream fat free or regular? LOL! I'm in the same boat...but I already added the sour cream...gonna try it! It's light sour cream. I'll let ya know! Haha, me too!! Read only the post on Pinterest before I bought the ingredients. In the oven now, with sour cream. Will let you know how it turns out! I made it this way tonight with fat free sour cream, added garlic powder, used the powdered parm cheese and seasoned the chicken with a little bit of adobo.... So yummy... Thanks for sharing.. Same thing...Pinterest, sour cream... made it... not juicy, not a lot of flavor, feel like it was a switch and bait. Same pictures but different recipe and the cooking time was not indicated. I ended up taking the cooked chicken, using it the next night, thinly slicing it, saute mushrooms, and added Alfredo mushroom sauce with spaghetti and THAT was good. I think that because sour cream and yogurt doesn't have the egg and oils that mayo does, that that's the reason why it's not coming out with a lot of flavor and the breadcrumbs lacking crunch. If you absolutely have to cut out the fat, I'd definitely suggest just using lite mayo. But as my bariatric doctor recently told me... "Lite and low fat items are strictly marketing schemes to get you, the dieting consumer, to buy them. The difference in fat and calories between the lite and regular item is usually so nominal that it really won't make much of a difference when used in moderation." Well, crap! I just slathered a bunch of yogurt and grated parm on three breast filets (I always cut my breast in half, lengthwise so I end up with thinner breasts) and was looking up the orig Pinterest post to see what temp to cook these on and now I see all these comments!!!! Hope this isn't going to be another recipe my husband scoffs at! Anyway, since I cut the breasts in half, lenghtwise, I still have three left and have mayo, so I'll try the orig recipe and see the difference. This teaches me a lesson: You really have to go to the original source when you find stuff on Pinterest. I enjoyed it with the sour cream. I don't know what the mayo tastes like, so I can't compare but my whole family enjoyed it! I did hit it with the broiler at the end of the cooking time - that helped make it crunchy. Can't wait to try this tomorrow night! I am not a fan of mayo so I will be trying the sour cream and the dash of garlic powder someone suggested. Do you put the mayo/parm on top and bottom or just on top? Can't wait to try this! I made this with sour cream and mixed in some garlic powder and onion powder with the sour cream and parmesan cheese, it game out good and my kids liked it too! Trying this tonight and super pumped! Wish my man was in town to eat this with me...oh well, more leftovers for me!!! Thanks for sharing!! I have made this 3 times already, and it is always a huge hit. What I love about it is it's very easy to prepare and only takes 20 to 25 minutes to cook. This has become one of my favorite recipes! Found this on Pinterest. I made this for lunch today, and it turned out pretty good. I'm not a mayo fan, but I wanted to give it a try. It tasted too mayo-ee for me, but my mayo loving husband loved it. The topping was delicious with the green beans, lol. Next time (and I think there will actually be a next time) I think I'll use half mayo and half sour cream. Also, I only had plain bread crumbs (I prefer to buy plain and mix in my seasonings) and I mixed in some dry ranch seasoning I had sitting around. I really like how easy this is to prepare and how easy it is to customize the flavors to your individual taste. This topping would be great with a lot of meats too. It could work on pork chops, tenderloins, fish, and maybe even burgers (YUM!). what if your chicken is frozen? For the best results, I recommend de-thawing in the the fridge first. De-thawing? You know that means "freezing", right? According to Dictionary.com: "dethaw - verb - become or cause to become soft or liquid"
seems easier to say "thaw"
I made this tonight with greek yogurt! Sooo good! I noticed in your ingredients list in your recipe, you have it down as GRATED parmesan, but it looks in your picture like it is SHREDDED parmesan. Which one should we use? Oh you are so right, thanks for pointing that out! I should have said shredded and I'll make that change now. Others have commented they've used the powdery kind and been happy with that as well, but I like the shredded. Thanks! I really want to make this sounds so good. I Printed it out but it took 11 pages of paper to do so. You just copy and paste the url for the recipe posting you want to print (for instance copy/paste this one: http://theenchantedcook.blogspot.com/2011/10/parmesan-crusted-chicken-hellmanns-mayo.html) and it will give you a printer-friendly version. I'm gonna go rogue and try this in the crockpot. I'm always looking for recipes I can adapt to make ahead of time. Looks yummy! Great idea! Curious to see how it comes out! Mayo mixture on both sides of chicken? I made it last night with plain greek yogurt and grated parmesan cheese - it was DELISH!! Thanks! I found this on pinterest and made it the mayo-way with roasted potatoes and green salad for dinner tonight. I did reduce the mayo by about a third though. It was a hit. Next time I'll try it with greek yogurt, oregano and lemon. Yum! I found this on pinterest too. I served it with fettuccine alfredo and broccoli. Everyone liked it. Next time I make this, I am going to do it in a baking dish. I think I might also spread the mayo mixture on the top and bottom. The breasts i had were big and it would have been even better if I had pounded them a little. This is definitely a recipe that I will try again. I, too, found this on Pinterest but I also found a similar recipe on Allrecipes.com using ranch dressing instead of mayo. My son, who doesn't like ranch dressing, loves the chicken made this way. I'd also like to try it with Parmesan peppercorn dressing. I've also used crushed rice krispies, crushed crackers or crushed corn flakes instead of bread crumbs - gives it much more crunch. In a pinch, you can also make some regular toast, leave it out until it's cooled completely, and crunch that up. I tried this recipe on pork chops and it was delicious! It will be a keeper in my recipe collection! How long did you cook the pork chops? Where they boneless? Do we turn the oven on? or do we just place chicken in the oven for 20 minutes? haha what temperature do we set the oven for? I wanted to try this but my hubby WILL NOT eat anything with mayo on or in it. So, I used 1/2 Cup plain yogurt. It turned out awesome!! The whold family loved it! I did this tonight with frozen breasts and it still turned out great! Thank you so much for the great recipe! Made this recipe tonight for my husband, son, and in-laws. It was a big hit! Everyone loved it! I can't wait to try this with chicken. I've made it with flounder filets and sometime have used cod. Is there a way to print these recipes out that doesn't have all the photos? 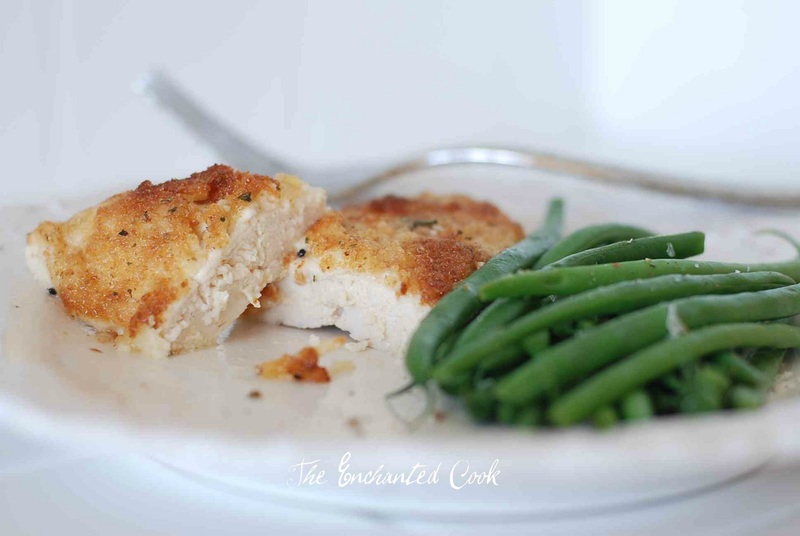 You just copy and paste the url for the recipe posting you want to print (for instance copy/paste this one: http://theenchantedcook.blogspot.com/2011/10/parmesan-crusted-chicken-hellmanns-mayo.html) and it will give you a printer-friendly version. You cn select not to print the photos. I made this last night 4/13/12. It was REALLY good! I used Hellman's Light Mayo mixed with Light Sour Cream. I pounded my chicken breasts first so they would be thin. They cooked all the way through with no problem in 20 minutes! I tried this tonight with sour cream and it was FANTASTIC! Thanks so much for sharing it with us. I love recipes that are easy and call for few ingredients. It really helps this new teacher who's trying to live on a budget! I made this with non-fat plain Greek yogurt and Panko bread crumbs (as that is what I had on hand). I added some fresh ground pepper and it was wonderful...and guilt free! Adapted this recipe last night since I had tilapia on hand and no chicken. Was AWESOME! Used the powdery type of parmesan and it was perfect. I didn't even have to add extra salt to the fish. Will be making this much more often with fish, chicken, and maybe even potatoes? YUM! This is perfect! it is healthy and it is very easy to make! any advise on how to cut chicken breast to make all uniform in weight? Some of my chicken breast are over a pound. ie cut in half from side to side or run knife blade completely through breast as if you were butterflying. Hi Deb - Yes, I just carefully run a knife horizontally through the middle of each breast and butterfly them, but cut all the way through so you end up with 2 pieces. I too have pinned this on pinterest. Made it last night for a quick dinner. Served it with Green Gaint green beans with almonds and rice pilaf and a glass of Chardonnay. We loved it. I used Hellman's light mayo. Yummy! Ok I've got a question. How would I make more? I need to make at least 6 pieces if not more of the chicken. I have a BIG family so just 4 pieces won't feed my family. Do you think I could just get a cookie sheet out and put parchment paper on that and use that because it's bigger than a 13X9 dish. This recipe is easily doubled. A larger pan such as a cookie sheet would work great. Cook time may be longer depending on the thickness and quantity of chicken. I used half light mayo and half light sour cream, and mixed some crushed garlic into it for extra flavor. Used panko instead of regular bread crumbs. Delish! Thinking of mixing some goat cheese in next time. Also my 1.4 lbs of chicken was in 3 large breasts so i cut them to make them less thick, and it cooked in 20 minutes. Do mind if I pin this to my recipes on pinterest...would love to try it!? Please do, and thanks so much! This was excellent and very easy! I will have to use it at one of my future monthly dinners! Thanks for sharing. Is it only crispy on one side? I am on Phase 1 of the South Beach Diet so I cannot have bread. Do you think it would be okay without the bread crumbs? Maybe sprinkle more cheese on top?? Thanks! I've never tried it that way but I'm guessing more cheese would be good, and maybe less mayo. I would also add some seasoning like salt, pepper, garlic powder, and maybe some Italian seasoning. If you try it, please let me know how it comes out. If you can't have bread crumbs, there is a product found at health food stores called Texturized Vegetable Protein (TVP) that you can substitute for bread crumbs. It comes in a shape that looks like a crouton, but I just put them in a food processor or blender and make them into the consistency of bread crumbs. You can add any seasonings you want to them. When sprayed with a little bit of olive oil before baking, they crisp up and you wouldn't even know they weren't normal bread crumbs. I use them all the time to make "fried" (baked) chicken for a buffalo-chicken salad. I made this for my daughter and my husband last night. My daughter is extremely picky and she loved it! I did alter the recipe a little, I substitued the mayo for fat free sour cream, a little healthier! I also tenderized the chicken. My husband requested that this recipe get put in the favorites rotation! Thanks for such a delicious and simple recipe. Hello, this recipe looks great:) I was wondering if i could use grated cheese instead of shreded???? I made this last night. It was great but there was a lot of liquid at the bottom. I am making this for dinner tonight. I also saw it on Pinterest saying to use sour cream or yogurt. I'm going to use plain greek yogurt. I also am gluten free so will be skipping the bread crumbs. I do plan to add some garlic to the yogurt (I add garlic to everything) and maybe some lemon juice after reading the comments. I was also thinking some basil too. I will come back and comment on how it turned out. I made this today and it is delicious! I used mayonaise and followed the recipe exactly - it is so yummy. I will definatley make this again ~ easy and very good! You should really add the oven temp up top. It is PIA to skim through all the comments to find 425 for 20 minutes. It's right below the title of the recipe and how many it serves. Just above the list of ingredients. Same format I follow for all of my recipes. Thanks. I am making this tonight, to cut back on calories and fat I am using reduced fat sour cream. I pinned this from pinterest without coming to look at the actual recipe, and the pinner said use sour cream or yogurt. I am sure it's still going to be delicious! And to give it a little kick, I am adding some ranch powder to the sour cream! Well, I did try this recipe. Not overly impressed, flavor was there but it did not brown like the picture shown. Not sure what I missed. But what I really did like was that it came together very fast! Definitely 20 min to the table!! Best chicken I've ever had in my life! I substituted plain Green yogurt for half of the mayo, used an Italian cheese mix, and added a little garlic salt to the cheese and mayo/yogurt mixture. Absolutely delicious! Hi there - I made this with regular sour cream just now. After reading reviews, I mixed the sour cream with some onion powder, garlic powder, a touch of garlic salt, and some black pepper. That--combined with the shredded parm--made for an absolutely delicious meal! I cooked at 425 for 25 minutes and then broiled for an additional 4(ish) minutes. Mine browned very nicely! Heavenly. Thank you for the recipe and all the suggestions along the way! Just made this for dinner! I used Greek yogurt instead of mayo. I think sour cream would be yummy too!! Only probably I had was that it didn't really get crispy:(. Was my mixture too thick? Too many breadcrumbs? Either way, I got an A+ from my hubby!! I made this last night. A few modifications after reading about it being a little bland.. I coated my chicken with freshly minced garlic, salt, coarse ground pepper, lemon juice. then coated them with sour cream/parmesan mixture. I cooked them in a small glass pan coated with a little cooking oil and topped them with bread crumbs and more pepper. Turned out great, really moist and the sour cream tasted amazing. Only thing I might change is the bread crumbs. I would try panko next time and broil it for the last couple minutes to really crisp is up, even lightly spray the top the the panko. Mine browned but it was really bland. Sad because it was super easy. Hi there - did you go with the recipe - mayo/light mayo, italian bread crumbs, etc? Just don't use Miracle Whip! Yuk, too sweet. I made this last nite..wow wonderful..I did everything except didn't have bread crumbs so I took a can of french fried onion rings and rolled them into crumbs in a bag..it was so great..ty! This is now a new favorite thing! Saw on Pinterest! In oven right now. I used yougart. Hope it's good. I had to pour lots of liquid off because I didn't want it to "boil" -- so to speak. I may have done something wrong because this is s-l-o-w cooking. This is the five recipe that I have tried from Pint rest and it was a HUGE hit! Some minor tweaks were made. I used Greek yogurt and for the bread crumbs all I had were panko. My hubby loves this. This is the most requested dish in my house! I just made this for dinner and sooo yummy! I can't wait for my husband to get home to try it, too. I did use Miracle Whip instead of mayo. I didn't think that it was too sweet but I prefer Miracle Whip to mayo anyway. Next time I'll definitely try the greek yogurt, too! Hi i was wondering i dont have chicken thawed but i really want to try this tonight. Do you think if i boiled the chicken for like 15-20 min and then baked it like directed above for another 20 would that be okay? Thanks so much! Just made this with almost 3 lbs of chicken. Doubled the recipe, but otherwise followed to a "T". The mayo does not really dissipate and my daughter thought the layer under the crunch too wet for her tastes. I slathered on the mayo mixture like the picture shows. Next time, I will be a bit more frugal with that and add more parmesan. Yummy. Definitely will make again. Can you use split bone in chicken breasts and if so how long to bake in oven? Made this using a little sour cream mixed with the mayo and a little less mayo. It was better than just the mayo. I am making this recipe tonight but with plain Greek yogurt instead of mayo I will let you know how it turns out! Made this for tonight's dinner and it came out awesome!!! Very tasty. Thanks so much for this recipe! I made it just as you wrote, and it was SO good. Will definitely be making it again. Hi, my name is Adam, and Im something of a "closet cook", which essentially means cooking is a secret love of mine. After recently perfecting an oven (Thats right, OVEN) baked New York strip, i needed i new idea. We love pasta and i make a mean Szechuan chicken Alfredo, but it was getting old and my girlfriend found a new love in parmesan chicken (finally =)), so hear i am. I found this recipe here, tweaked it, and BOOM, she craves and demands it! LOL. I didnt have bread crumbs, but crushed crutons did the trick. I used mayo with olive oil and a parm/asiago blend, and an explosion of delicious blasted from our plates! Thank you. I now have a new recipe to play with that is simple and versatile. Guess what's next...? Similar recipe with different ingredients, Im thinkin some kind of tomato sauce with mozzarella and provalone, going to give it a chicken pizza/pasta twist! Once again, thank you, not only for the recipe, but for the love of cooking! Hi Adam - how wonderful! Definitely delicious and definitely versatile. If you get tired of chicken, try it on fish (like tilapia, halibut or sole) - it's amazing that way, too. I love your pizza-inspired version! I tried this tonight, it was very good. Even after the chicken was done though the tops did not brown, any suggestions? Hi - yes, you can finish them off under the broiler for a minute or two at the end to get them more browned. be sure to use a pan with sides. i didn't, opps. :-/ hope it tastes good and is worth the mess i made in the oven! I didn't have any chicken, so I used bologna. I didn't have any mayo, so I used marshmallow fluff. I was out of bread crumbs, but I had sunflower seeds. I didn't see what temp to bake it at, so I used my expertise and microwaved it. This recipe is awful. I won't make it again. I love this recipe and your instructions are absolutely perfectly detailed. I wrote the post before this, just to be obnoxious I suppose. I was only joking, because I sat and read nearly every comment and cannot get over the criticism and questions for a simple recipe such as this. Come on there are four ingredients, it's just not that hard. Go out on a limb, try it! I hope you like this awesome recipe. Thank you for writing . This is a super easy and tasty recipe. I did play with it a bit the second time I made it though. I added a couple of tablespoons of sour cream (low fat) to the mayo (low fat also) to equal the 1/2 cup then I mixed in about a teaspoon of spicy ranch salad dressing/seasoning mix. I didn't really measure, just did it to taste and it was super yummy. A nice little kick to the chicken! This is a great base recipe to keep experimenting with! This is just a great recipe. I've made it with grated parm, shredded parm, lite mayo, olive oil mayo, regular mayo, greek yogurt -- it's really hard to mess this one up. Both my kids love it -- even my younger guy, who is the pickiest eater on the earth. Thanks for posting this! That's awesome and I agree - incredibly easy and versatile! This is one of my "go to" dishes. I pretty much always have the ingredients on hand and it only takes 20 minutes. Makes for a perfect last-minute dinner. Yum! I made this tonight and my husband LOVED it. my boys age 3, 5, 7 wouldnt eat it though. I guess i will make boring chicken for them from now on and yummy chicken for us grown ups! I made it exactly as shown... i dindt have the bread crumbs on hand but i made some in the food processor and just added italion seasoning, garlic salt, pepper, and onion powder. I also used the parm in the can and it tasted great! Will Miracle Whip Light work instead of Mayo? Hi there - A couple of people have commented about using regular Miracle Whip (none have mentioned the Light version) - one loved it and the other said it was too sweet. I'm sure Miracle Whip will "work", but as far as the flavor goes, it just depends on your taste as it may come out on the sweeter side. Good luck and hope you enjoy the dish as much as I do! I am thinking about making this dish for my sons wedding, so I need to make 120 chicken breasts! What do you think about preparing it the day before? While working in a hospital cafeteria some years back, I was told to prep 6 whole turkeys for the public to eat. All the ingredients sounded fine except that one of the cooks told me the recipe called for mayo on the bird. We all thought that sounded strange, but nonetheless, I proceeded to spread the mayo all over the birds and seasoned them. When the registered dietitian came to check on the birds, she almost died of a heart attack. She said butter, not mayo. Alas, it was too late to do anything about it, so we baked them. All the customers and staff said it was the best turkey they ever had. From then on, we always used mayo on our turkeys and chickens. I came across this on pinterest about two months ago, and it's become a regular in our dinner rotation! Everyone loves it, even my extremely picky three year old. Here's the kicker. I hate mayo. I don't eat it normally, so I was convinced I'd have to eat peanut butter sandwiches while everyone else had "real" dinner. But I didn't ! It was so good! Thanks for convincing me to try it. Made this for supper tonight. Used 1/4c Light Hellman's mayo, 1/4c light sour cream, ~ 1/2 c good parmesan that I shredded. It was fast and delicious, I was amazed! DH and I are foodies and will definitely make this again. Great for a work night dinner, but I'd make it for guests too, it was excellent! Is it necessary to marinate/season the chicken beforehand? And if yes, what would be the best kind? Hi - no, not at all. I will sometimes sprinkle with a little salt and pepper but not needed. Great recipe! The whole family loved it! I used some Italian-style Panko bread crumbs, which made the crust super crispy. I can't wait to make this recipe again! Kraft has a similar thing out now where they give you the grated cheese & seasoned bread crumbs to mix together. We just had the Italian parmesan one a few days ago, so.... enter another variation. I used plain greek yogurt with a twist of lime. I added a pinch of salt to the chicken, then spread the yogurt. I topped it with a mixture of crushed corn flakes, melted butter and Mrs. Dash's chipotle blend. Yeah - that's a keeper for sure! I just made this using sour cream and a mixture of swiss and cheddar (no parm in the house). Fabulous! Bit hit, thank you, thank you.